After talking with dozens of people in Russia, Ukraine, Azerbaijan, and Kyrgyzstan, two contradictory, prevailing themes emerge about the United States. THE UNITED STATES has a major public relations problem in former Soviet countries. Not only in Russia, but in Azerbaijan, Kyrgyzstan, and even Ukraine, ordinary people see the U.S. as an arrogant, hegemonic superpower that meddles in the affairs of other countries in a cynical pursuit of its own interests — perceptions that dovetail with the Russian government’s official critiques of the United States, which may explain the success of these particular memes. At the same time, citizens of these countries respect and admire American economic power, technology, culture, and, to some extent, its political institutions. This dual-sided picture — often obscured by crude survey-based measures of views of America in post-Soviet nations — emerged from 18 focus groups we conducted in Russia, Azerbaijan, Kyrgyzstan, and Ukraine between April and August 2014. To restore American soft power in the region, the United States should reduce direct support for civil society organizations in former Soviet countries and others that lack intrinsic demand for civic engagement. American financing of these organizations has played into the hands of authoritarian leaders who portray such backing as evidence of American interference, hurting the reputations of both the U.S. and the local NGOs that receive American funds. Instead, American policies should emphasize programs which spread and deepen knowledge and appreciation of American institutions — more exchanges of people, ideas, and cultural products. Since the late 1980s, the United States has sought to promote democracy in semi-authoritarian and transition countries by providing financial and technical support to NGOs that pursue civic and political causes, election monitoring efforts, and oppositional political parties. These policies appeared to bear fruit when popular democratic movements helped overthrow dictators in Chile, Nicaragua, and Serbia, and with the successful “color revolutions” in Kyrgyzstan, Georgia, and Ukraine. The approach has been less successful in Russia, and has contributed to a general curdling of U.S.-Russian relations. In 2009, the U.S. Government Accountability Office (GAO) reported that from 2006-2008, federal agencies spent nearly $100 million on democracy promotion in Russia — much of it in the form of funding for “civil society programs” — making Russia the sixth-largest recipient of U.S. spending for that purpose. Russian President Vladimir Putin’s October 26, 2014, speech at the “Valdai” discussion club received worldwide attention for its condemnation of American foreign policy. Putin claimed the United States actively interferes in the affairs of other countries, cynically foments “color revolutions,” and even supports Islamic terrorists under the guise of promoting “peace, prosperity, progress, growth, and democracy,” all in order to preserve its dominant, hegemonic position in a “unipolar” world. The level of vitriol in Putin’s Valdai speech may be unprecedented, but its content is not. If Russian critiques of the U.S. hold sway, it poses a major threat to American “soft power” in former Soviet states. As Thomas Carothers observed in a 2006 Foreign Affairs article, Putin has been leading a “backlash” campaign against American democracy assistance since 2005, when Russian officials began labeling domestic human rights NGOs with foreign funding as a traitorous “fifth column,” a now-standard moniker in official speeches and pro-Kremlin Russian media. In a February 2007 speech in Munich, Putin sounded the themes of unipolarity, U.S. hypocrisy in preaching democracy and human rights, and its interference in Russia’s sovereign affairs. After spontaneous protests arose in Russia following allegations of widespread fraud in the country’s December 2011 parliamentary elections, Putin blamed the revolts on U.S. Secretary of State Hillary Clinton, charging that she sent “a signal” to certain “actors” in Russia — a threatening specter of American menace which became a prominent theme throughout Putin’s 2012 presidential campaign. In his March 18, 2014, address on the “reunification” of Russia and Crimea, Putin again labeled those who oppose his policies as a “fifth column, [a] disparate bunch of national traitors” supported by foreign interests. Although its main audience has been domestic, the Russian government has actively sought to export this message, investing massive resources in its international “RT” (formerly Russia Today) media network, which now can reach 600 million people worldwide with broadcasts in multiple languages. Domestic Russian media broadcasts are ubiquitous in other former Soviet republics, offering a steady diet of reports dramatizing United States interference in other countries’ internal affairs, highlighting problems in America, and portraying developments such as the collapse of the Yanukovych government in Ukraine, the downing of flight MH-17, and combat in southeastern Ukraine as direct results of U.S. actions. Rhetoric aside, the Russian government has passed a series of laws tightening the screws on foreign-funded political NGOs; requirements that they register as “foreign agents,” with connotations that they are spying for foreign governments, are just one recent example. 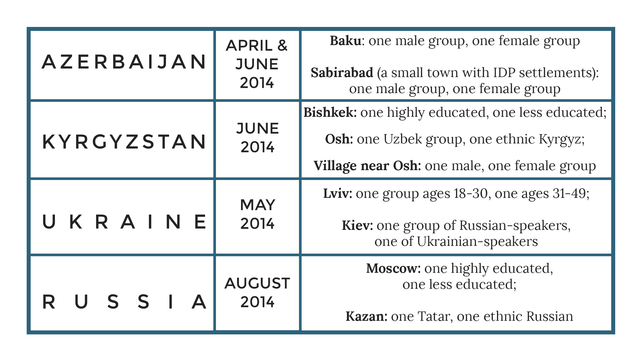 The influence of Russia’s campaign is evident in copycat legislation enacted in Kyrgyzstan, Azerbaijan, Yanukovych’s Ukraine, and elsewhere, which has cracked down on foreign-funded NGOs, domestic protesters, and oppositional groups. In sum, Putin and his associates have put forward a concerted, sustained critique of American democracy assistance for nearly a decade, threatening not only to undermine efforts at democracy promotion, but also to tarnish the broader image of the United States. If the Russian critique holds sway, it poses a significant threat to American “soft power” in former Soviet republics, much to the long-term detriment of United States foreign policy. There has been virtually no empirical research into whether the populations in these countries actually buy the Russian critique. Survey researchers regularly investigate how Russians feel toward the United States, and similar studies have been done in Ukraine. Predictably, Russian public opinion on the United States has fluctuated; negative views surged following the Iraq invasion and, even more so, in the last year, after the Crimea takeover and hostilities with Ukraine. But apart from these flag-rallying, event-driven episodes, generally less than half of the Russian population has expressed unfavorable views of the United States. 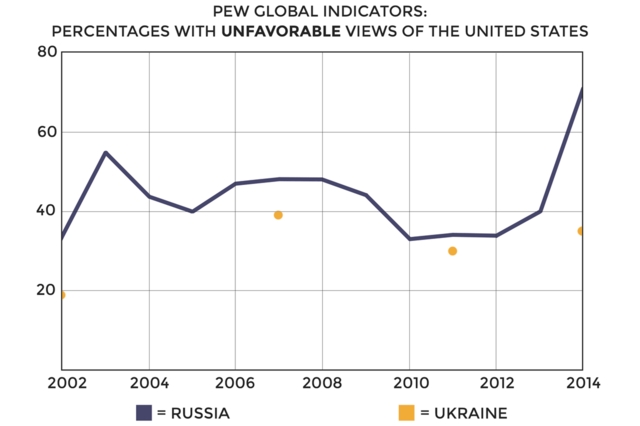 The more sporadic negative numbers in Ukraine have been consistently below those for Russia, but in 2014, about one-third of Ukrainians polled were unfavorable towards the United States, despite U.S. support for the Ukrainian government and economic sanctions against Russia. While informative, the survey data offer limited insight into the traction of Russian government arguments about U.S. democracy assistance. By their nature, surveys reduce nuanced and ambivalent attitudes to a single number, thereby potentially masking the underlying complexity of views. Anti-American sentiment within Russia increased modestly in 2006, just after Putin and company launched the Russian critique of American democracy assistance, but temporal coincidence does not demonstrate a causal relationship. Moreover, the waning of negative views in 2009 suggests other factors are at work. Without asking why Russians have negative views we cannot really say what is driving them. These focus groups’ small and selective samples mean that they are not necessarily representative of larger public opinion, but they provide substantially more detail than mass surveys about the reasoning behind people’s attitudes, and the language they spontaneously use to express their opinions. While journalistic interviews often seek a balance of views on an issue (or else push a particular position), focus groups obtain an objective sense of how a random selection of individuals think about the topics discussed. By comparing groups within and between countries, one can ascertain whether specific logics and narratives represent common themes or idiosyncratic expressions. Two contradictory themes regarding the United States emerged in the groups: one, skepticism and outright hostility toward American foreign policies and actions in the world; two, respect and admiration for American economic power, technology, culture, and, to some extent, political institutions. The rationales supporting the first theme testify to the resonance of the Russian critique of American democracy promotion, while the second theme suggests that despite such efforts, what might be called the “American way of life” still holds considerable appeal. NOT SURPRISINGLY, the anti-American theme was most pronounced in the Russian groups. With near unanimity, Russian participants voiced negative views of the United States that echo elements of their government’s critique. In particular, many blamed America for the Ukrainian conflict, claiming, for example, that America caused it in order to profit from arms sales or to install its military technology along Russia’s border (Kazan, Tatars). Several asserted that American soldiers were actually engaged in combat operations in Ukraine, and one insisted that the Americans shot down flight MH-17 in a botched attempt to target Putin’s plane. The breadth of anti-American sentiment expressed confirms the survey findings that both support for Putin’s policies and hostility toward the United States are at all-time highs in Russia. But the focus groups add important nuances to the picture obtained from polls. The passion and emotion that Russian participants expressed in regard to the United States were striking, and contrast starkly to the bored and detached tenor of discussions of political topics in past focus groups we have conducted in the country. Had participants merely been parroting official propaganda, it is unlikely the discussions would have been so heated. Yet, Russians’ views of the United States are more complex than pure condemnation. The same groups also expressed admiration for America’s economic achievements, democracy, high living standards, and American films, music, and television shows. “I have nothing against the American people, only against the American government,” said one participant in the less-educated focus group in Moscow. It was a common sentiment. Such acknowledgments that their own government manipulates information to suit its purpose indicate an underlying unease, belied by the evident conviction with which the Russian participants toed the official line. “I feel neutral toward the United States. 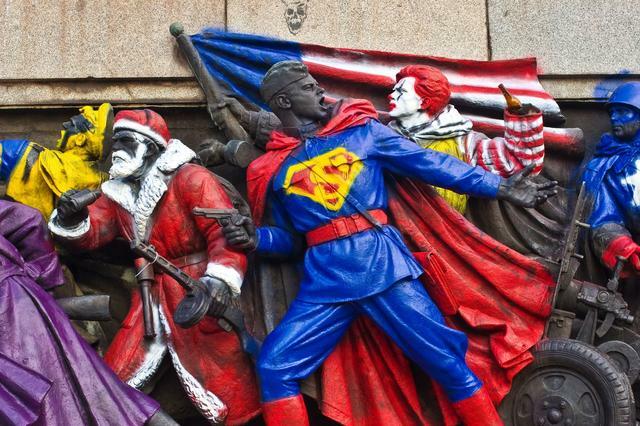 Even in Ukraine, America’s most potent form of soft power is not its effort to counter Russian aggression, but instead, America’s political, economic, and cultural institutions. The logical conclusion is that the U.S. can more effectively build a positive image by focusing attention on its way of life rather than its foreign policy. Despite America’s support for Ukraine in its conflict with Russia, the focus group participants endorsed America’s institutions more than its foreign policies. If even in Ukraine, the most potent weapons in America’s soft power arsenal are not its efforts to counter Russian aggression or to spread democracy, but instead, America’s political, economic, and cultural institutions, the logical conclusion is that the U.S. can more effectively build a positive image by focusing attention on its way of life rather than its foreign policies, which include democracy promotion efforts. These suspicions may have been provoked by video clips showing U.S. officials discussing their preferred candidates among Ukrainian opposition figures. To allay such fears, the United States should avoid providing direct financial support for Ukrainian political NGOs or parties, which could easily be perceived as meddling in Ukraine’s internal affairs. One Baku male respondent, after spontaneously blaming the Ukraine conflict on “U.S. and British imperialist forces,” said he had read in the newspaper that the United States is “preparing a revolution in Azerbaijan,” “wants to create disorder” to obtain oil, and tries to “undermine our relations with Russia” — all elements of the Russian government’s critique. Kyrgyz participants decried American permissiveness toward children, and lack of respect for elders (Bishkek, less educated). They discussed America’s remoteness compared to Russia, wasteful and pro-Uzbek American humanitarian spending (Osh, ethnic Kyrgyz), and America’s use of aid to interfere in Kyrgyzstan’s internal affairs (village near Osh, women). Kyrgyz and Azerbaijani participants expressed modest, if ambivalent, approval of NGOs that perform charitable tasks, but little familiarity and even less support for NGOs that pursue political causes. One Bishkek respondent quipped that there will be a lot fewer of them after the closure of the U.S. air base in Manas. The Ukrainians’ support for social service-oriented NGOs was stronger than we observed elsewhere, and they even expressed mixed views about political NGOs. While these positive views of standard civil society institutions were contested in the Ukrainian groups, they nonetheless stood out in their reluctance to embrace the Russian critique of protests and NGOs. FOCUS GROUPS MAY NOT be representative of the populations from which participants are drawn, and the generalizability of these results remains to be confirmed with survey data. However, the recurrence of the main themes across groups within and between countries implies that these views are not idiosyncratic. The core arguments made by Russian officials regarding America’s ambition, arrogance, self-interestedness, and penchant for using democracy promotion to meddle in the affairs of others, resonate with publics across Eurasia — even in countries like Ukraine and Kyrgyzstan, which have received significant amounts of American aid, and Azerbaijan, which has sought to maintain some diplomatic distance from Russia. 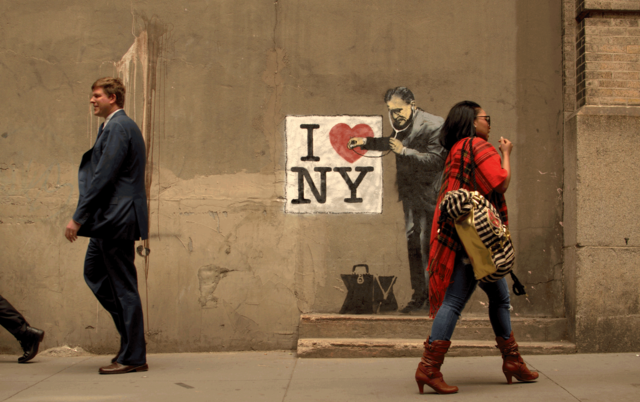 The appeal of the Russian critique poses a formidable challenge to American soft power. To restore a positive image of America, U.S. officials should scale back the type of democracy promotion that looks like meddling in favor of strategies that leverage America’s advantages — namely, positive perceptions of American institutions, economic, and technological achievements, and high living standards. The American way of life could be made a positive institutional model that ultimately encourages organic movements for change untarnished by the stain of foreign interference. Ways to do so include bolstering student, scientific, and other exchanges, encouraging more frequent travel, immigration, and trade between the United States and former Soviet countries, and quietly but assiduously promoting programs that expose citizens in Eurasia to concrete examples of American institutions. It is telling that many of positive views of America expressed in the focus groups originated from acquaintances of participants who have spent time in the United States. While no strategy is guaranteed to work, this approach has a better chance than continuing efforts to promote democratization by directly supporting local political NGOs and oppositional movements. Theodore P. Gerber is a professor of sociology and director of the Center for Russia, East Europe, and Central Asia at the University of Wisconsin-Madison. Jane Zavisca is an associate professor of sociology at the University of Arizona. This material is based upon work supported in part by the U.S. Army Research Laboratory and the U.S. Army Research Office via the Minerva Research Initiative program under grant number W911NF1310303.